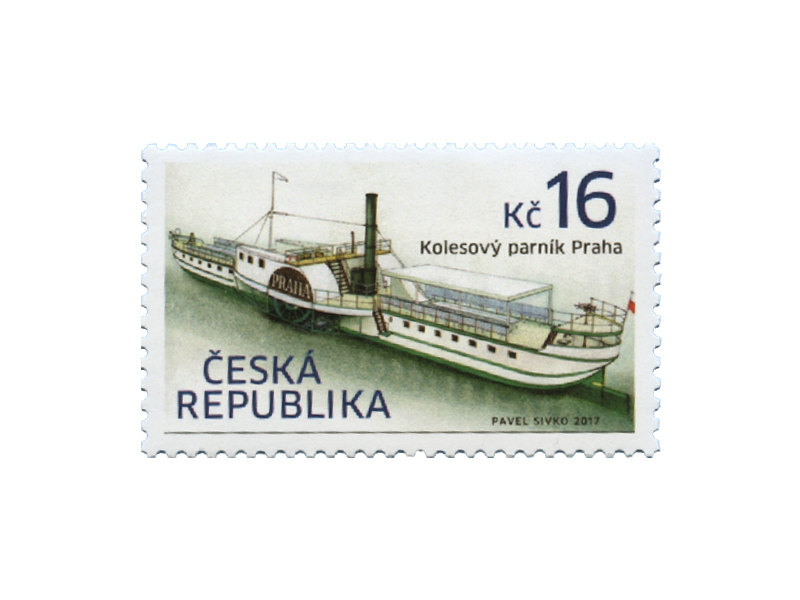 The Prague is another paddle steamer portrayed in the series of stamps dedicated to steamers in the recent years.The paddle steamer Prague styled PRAHA-PRAG was completed in the early August of 1865. The operator had to build wooden landing bridges, hire members of the crew and provide them with crew uniforms. The opening ceremony was held on 26 August. It was attended by the company shareholders, journalists and prominent Prague personalities such as Prague’s mayor Dr. Bělský, vice-governor Count Lažanský, Czech industrialist Vojtěch Lanna and others. After 27 August 1865, the Prague sailed between Prague and Zbraslav three times a day and successfully finished a full season of cruises. The operator PPS launched another large steamer, the Vyšehrad (a namesake of today’s steamer Vyšehrad from the late 1920s), in the next season. One steamer was then used on the regular route between Prague and Štěchovice and the other one sailed twice a day on the Prague-Zbraslav route.